This is officially the longest a room has taken to finish. 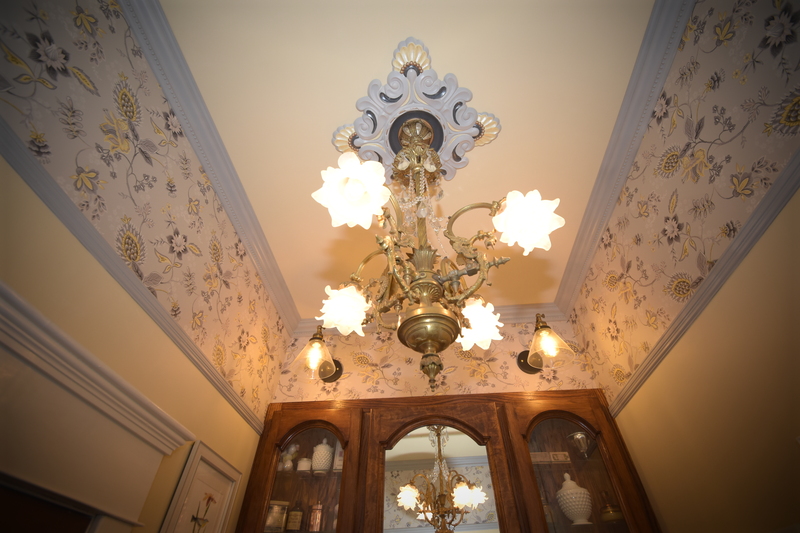 People ask all the time when we expect to be done with the house, and while the answer is probably “Never,” it’s fun to engage in the conversation. 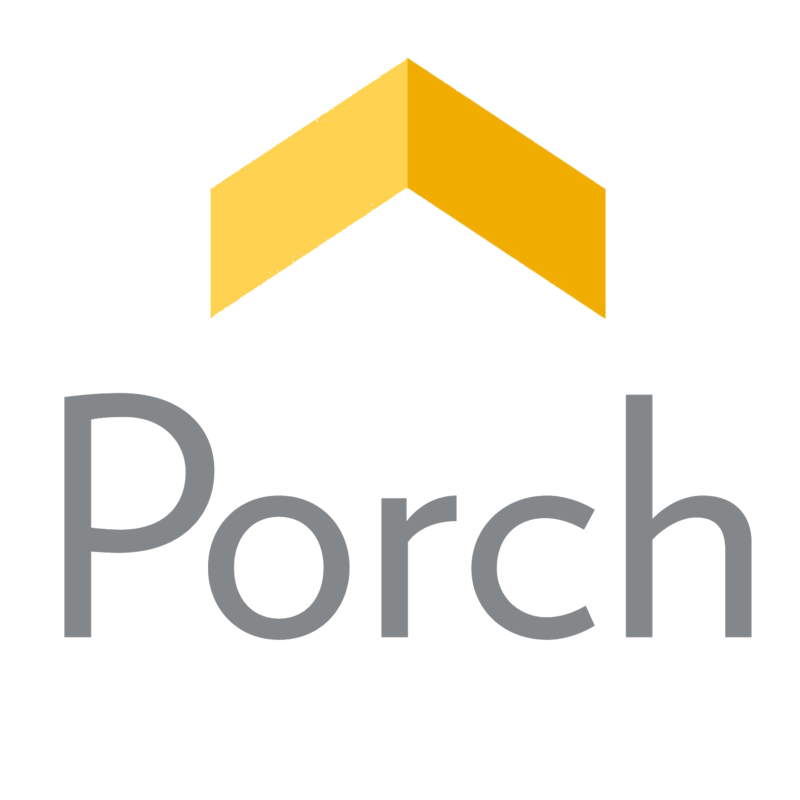 The first blog post for this room was January 30, 2017 – so we’re looking at a year and half on this one. I know some rooms will go faster, and others may go slower, but this felt like it took ages. But it was so worth it. It may also take you a year and a half to look at all the pictures I’m including on this post. I did trim it down from the 200 or so that I took, so I guess that’s showing restraint? 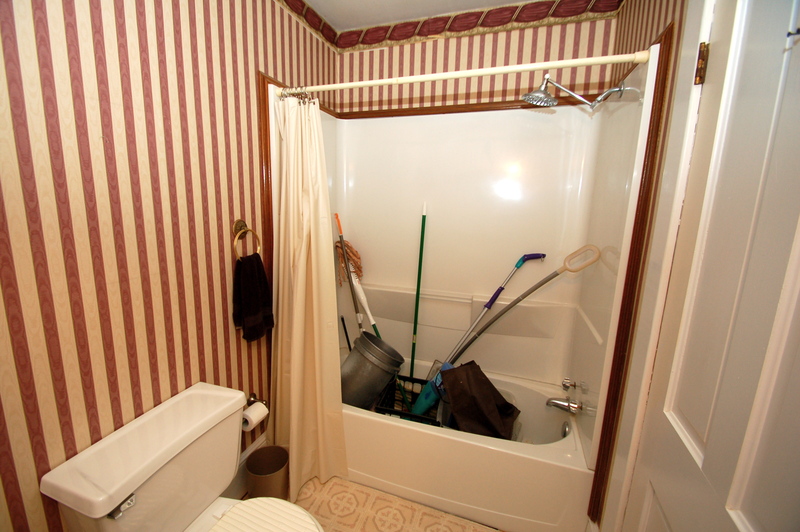 And the tub didn’t function, so it became a broom closet. 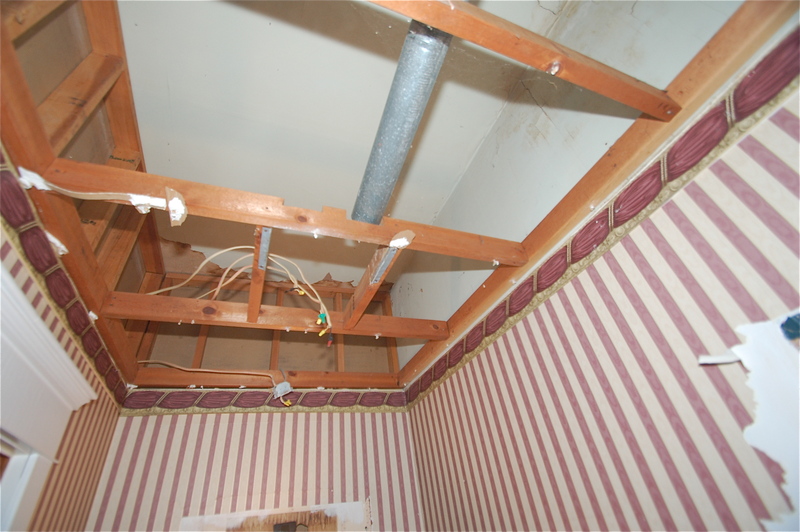 And we raised the drop ceiling! And found layers of paper! And a literal PIT OF DESPAIR. The amount of time Doug spent in here is unreal. He is an amazing human being, everyone. Pit of Despair no longer, my loves. Come on in! The floor still makes me gasp. Every time. Changing out the door was both practical and beautiful. The wood works perfect with the other wood on the first floor, and it also doesn’t have a giant crack that you can see light through. 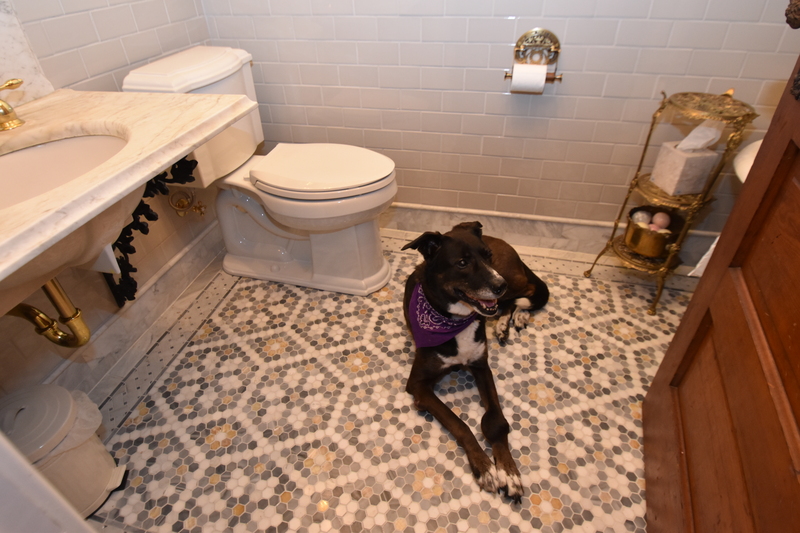 Bathroom privacy bonus! I finally have a clawfoot in this house. Words can’t express how happy this makes me. 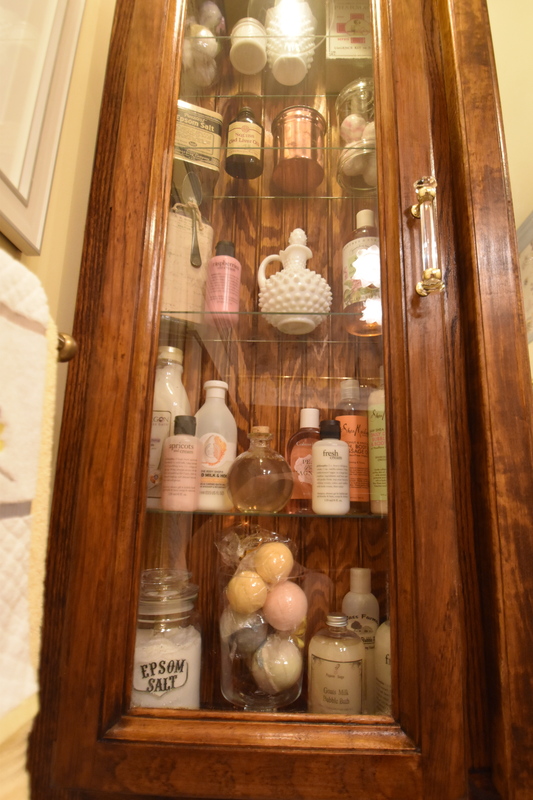 The apothecary cabinet turned out better than I could have dreamed. Matching the wood tones, taking up a whole wall, functional storage….. I love it SO MUCH. The left side is, in effect, a Bubble Bath Bar. This really should be a thing. Can I start this trend? I’ve been collecting bubble baths and bath bombs, and using them at least once a week. 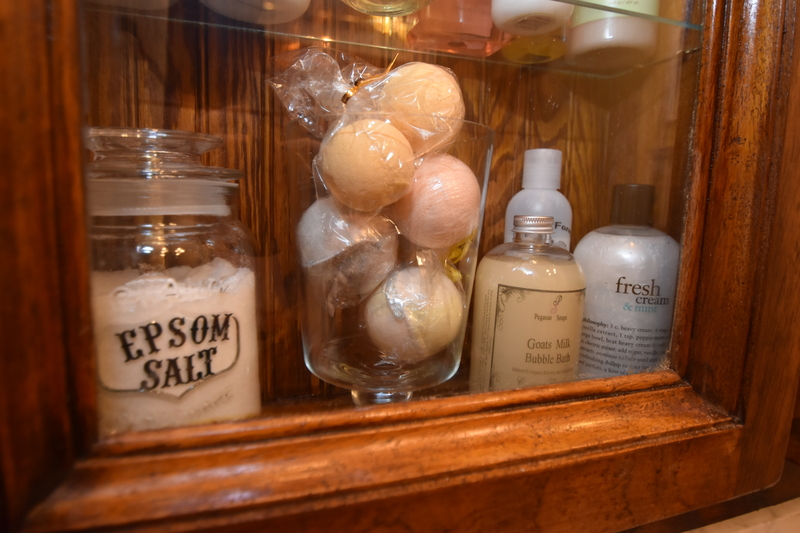 I’m going to keep collecting – my favorite is finding artisan soaps at Farmer’s Markets or on Etsy. If you find any (especially in lovely bottles), let me know! 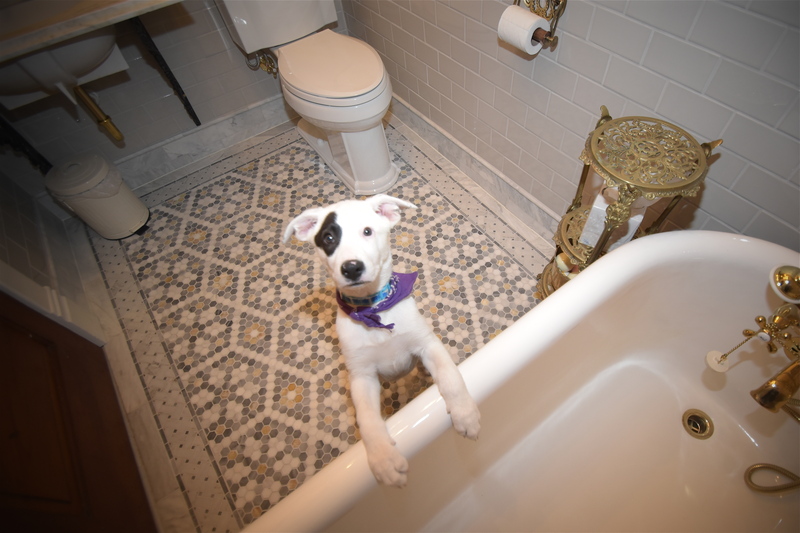 Epsom Salt is soft, but I wouldn’t use anything harder (like bath salts) on the finish of the tub. The Epsom Salts were in a commercial bag, and I made my own jar with some stationary sticker letters to make it all fancy. Every week, at least once, I’m taking time for myself to take a bath and read a magazine or a few chapters of a book. It’s already so amazing. 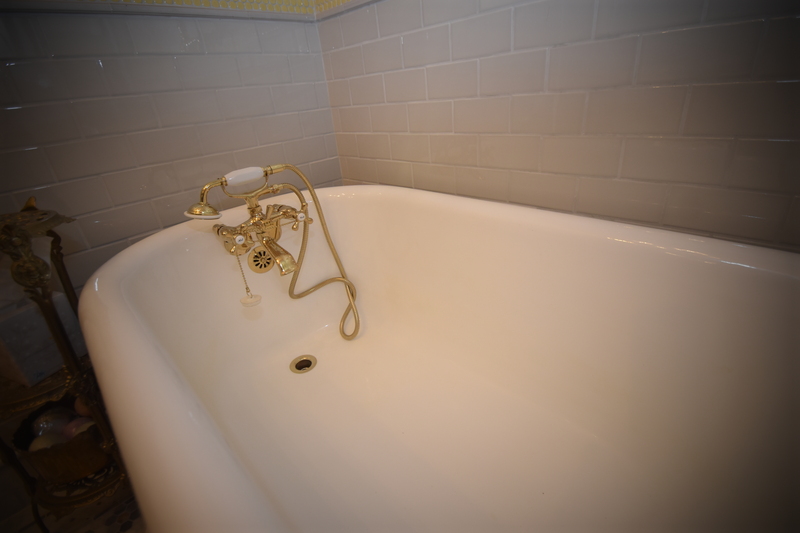 I now have a spa to get me through the rest of the renovation (which, as noted, is going to take at least 18 more years). Self care is important, friends. I only KIND OF thought about how the center mirrored door would line up with the chandelier, but it’s one of my favorite things about the room. 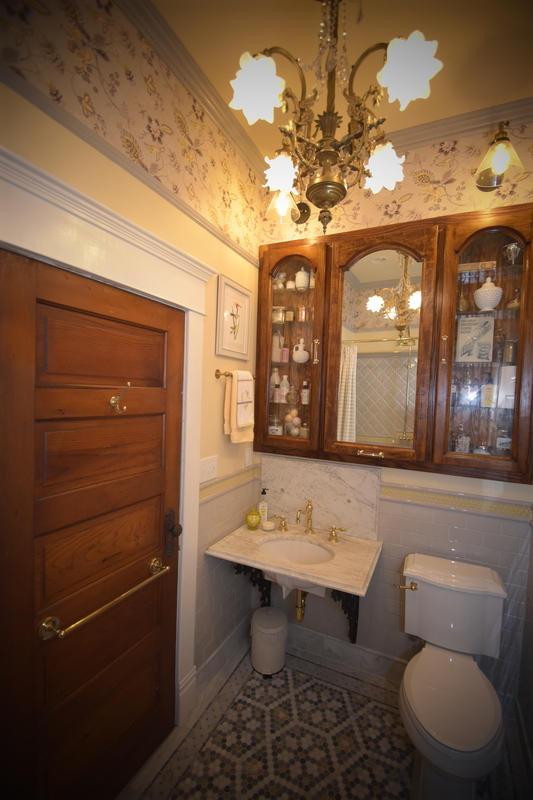 The right side has some antique apothecary bottles, and some things you’d actually use, like swabs and cotton balls and toilet paper. I mean, yes, there is a lot of pretty here. But I want this room USED, PEOPLE. Except don’t use the ancient toothpaste in original box from the early 1900s on the top shelf. Bad idea. Yes, I absolutely bought an antique apothecary bottle because MY NAME IS IN IT. 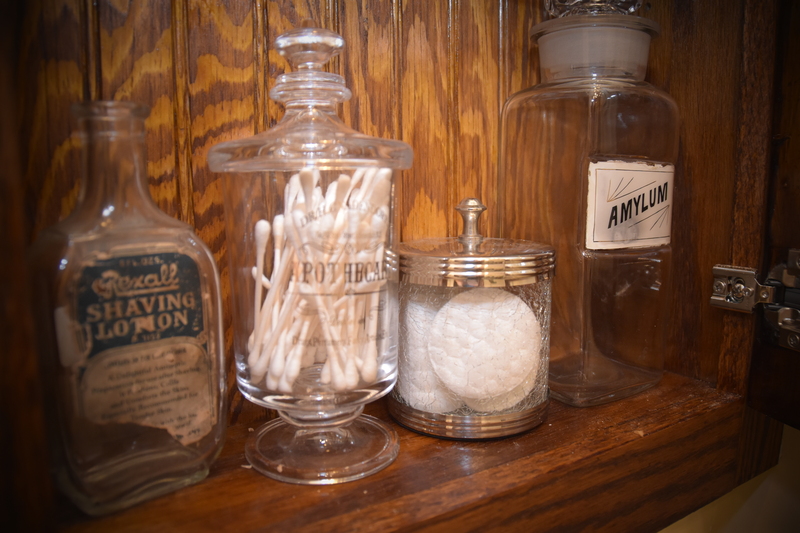 Today’s Apothecary Vocabulary Lesson is Brought to you by “Amylum.” Amylum is a starch – a carbohydrate (of course it is because potatoes are amazing) – and it was used in powder form as a topical agent. It could be used with talcum powder, or on its own, to be applied to heal sores and cuts. 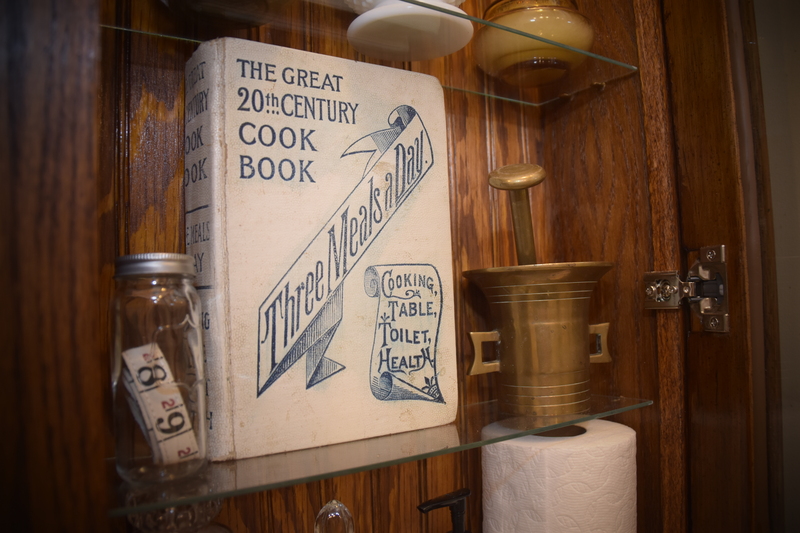 This cookbook, dated the same year our house was built in 1902, is amazing. Like many household books, it has recipes for food, but also instructions to make your own medicines, soaps, toiletries, salves, and first aid remedies. IT IS SPECTACULAR. 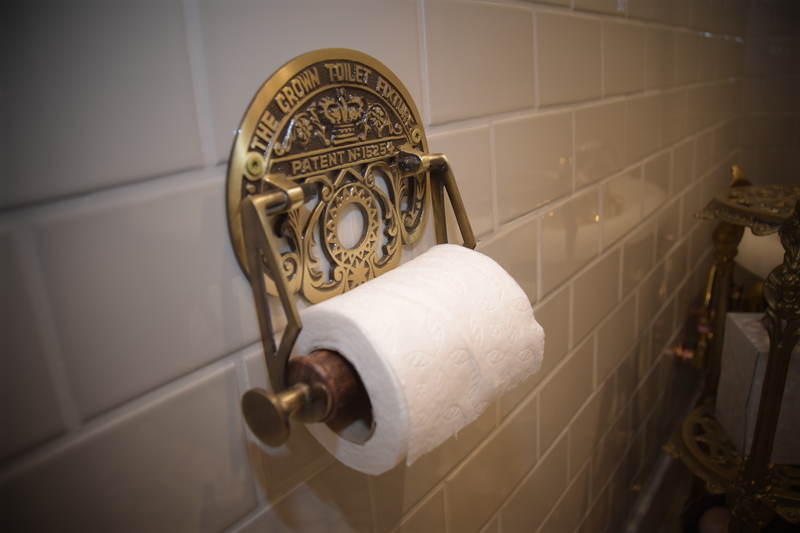 Since Victorian households needed to be equipped to do most medicinal care, it seemed only fitting to have this gem in the bathroom. I should do another post just on this book. 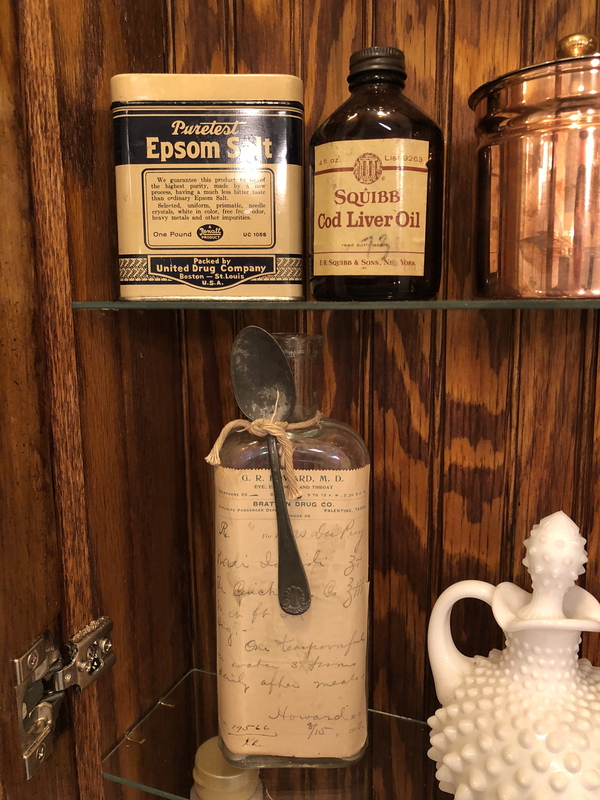 It’s been fun keeping our eyes out for antique apothecary things. 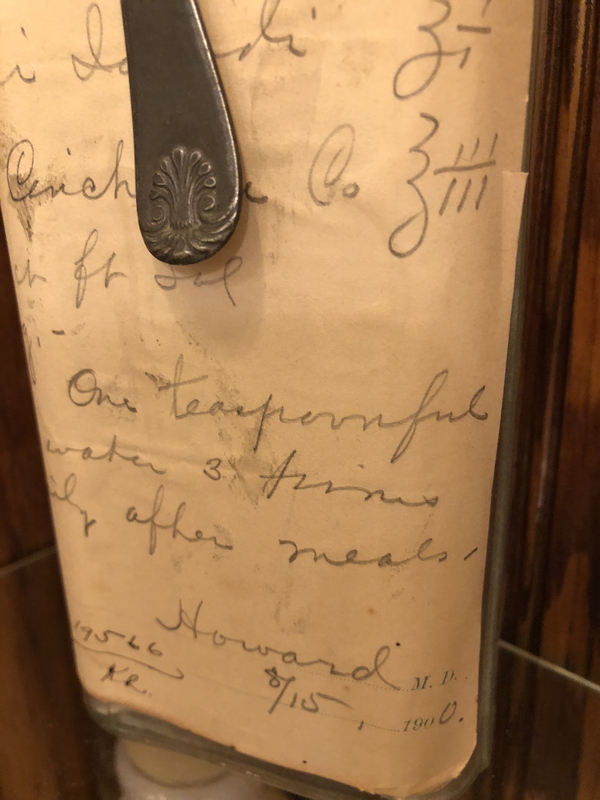 My favorite might be this bottle, which is really an old bottle that someone got crafty with, and decoupaged an old doctor’s prescription from 1900 on the bottle. It’s delightful. We found this in Nashville, Tennessee. The prescription paper itself is from the Bratton Drug Company in Palestine, Texas. The shower is a dream. 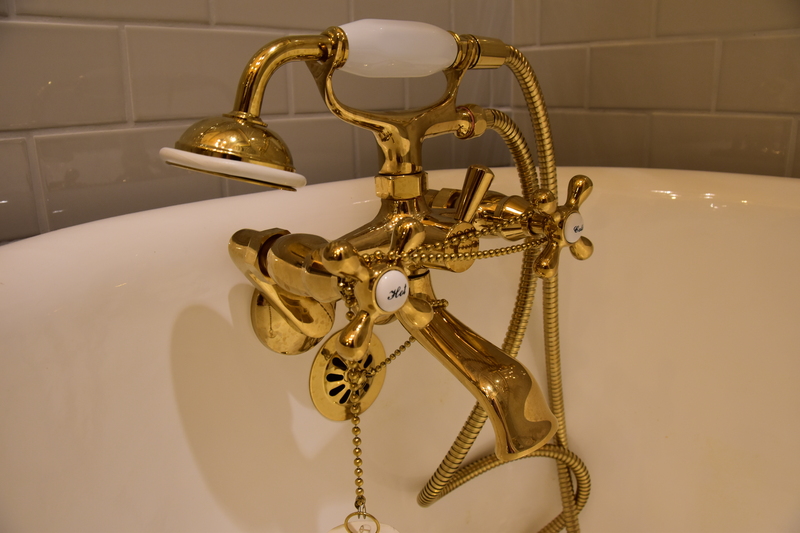 I love the brass fixtures. Chrome is really my favorite, but this was the perfect choice with the color scheme. 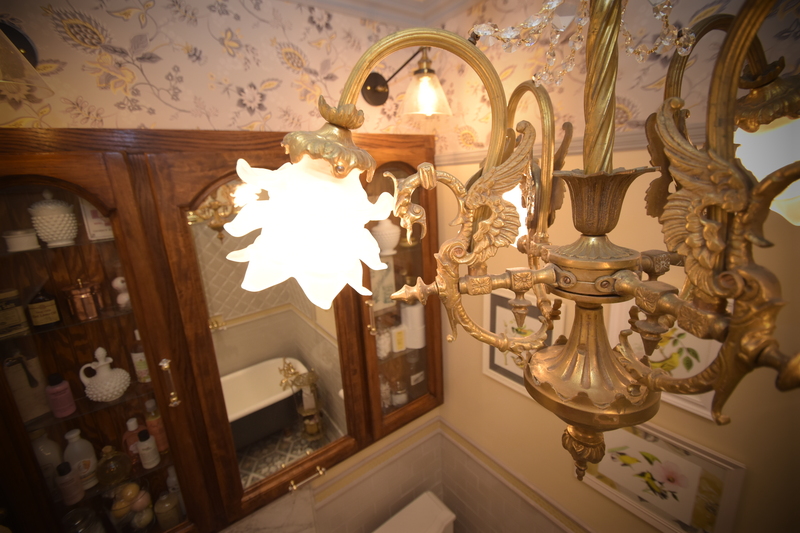 Part of the thrill of raising the ridiculously low ceiling was being able to put a completely obnoxiously perfect chandelier in the bathroom. Dragons. There are DRAGONS IN OUR BATHROOM. 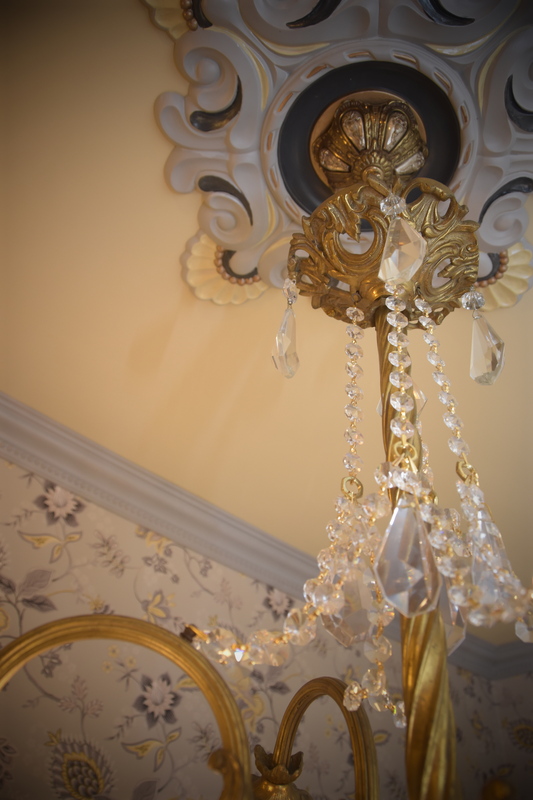 When you’re soaking in the tub, looking up to the ceiling medallion and the chandelier canopy is delightful. 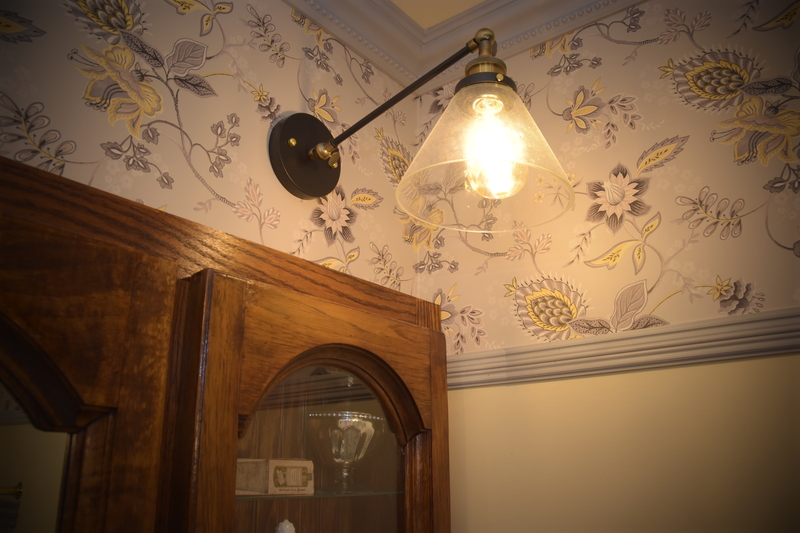 The sconces are purposely simple, but I like them a lot. 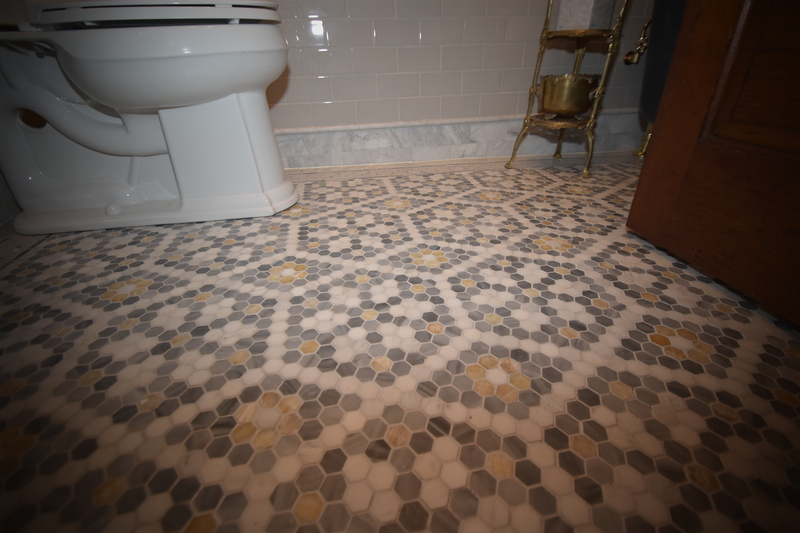 I’m already aching to do more complex tile floors. This was so much fun. SO MUCH FUN. 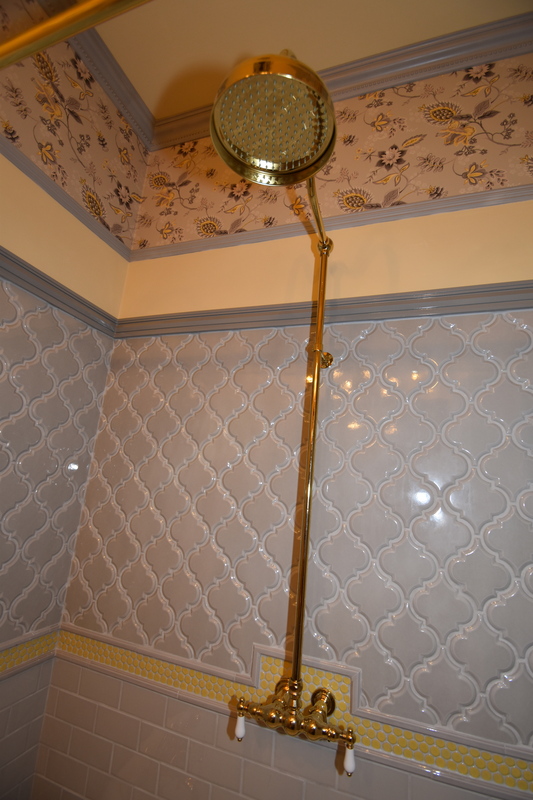 The wall tile and shower tile are also so fun. I love the colors together. 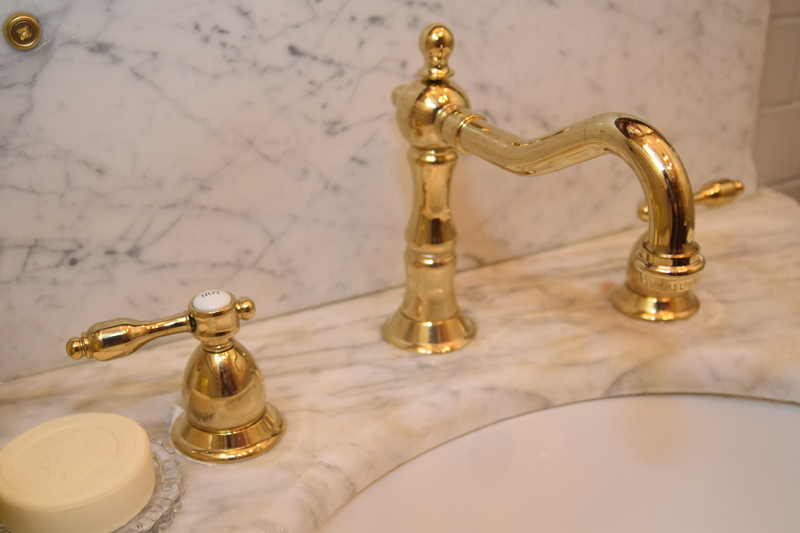 New faucet, but an antique sink rescued from an old house in Indianapolis. While it pains me that ANYONE would discard this, I am so happy to have given it a home where it will be loved beyond measure. Both girls came to visit during my photo shoot. Marina is going downhill, and probably won’t be with us much longer. But she is STILL SO HAPPY and loving. Bonny is ridiculous. We love her so much, but SHE IS SO PUPPY ALL THE TIME. This door is perfect. 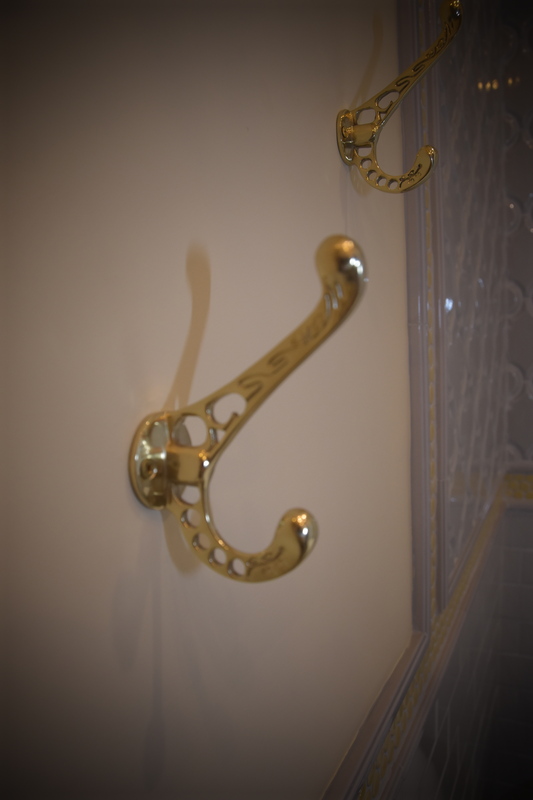 The towel bar and hook were added. 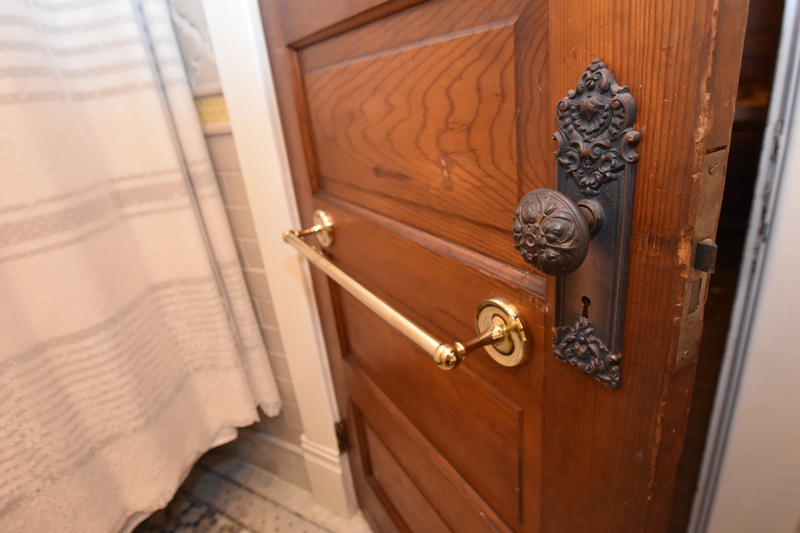 The handle came from the Preservation Station in Nashville, and we bought quite a few for the downstairs. 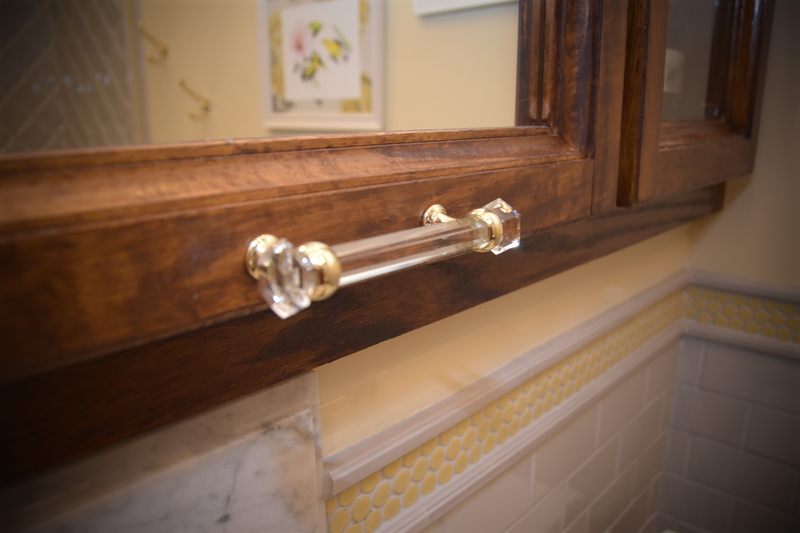 They are not an exact match to the original hardware in the house, but they are very close, and will be great to replace in the few spots where the original hardware has disappeared. The artwork is from a shop on Etsy. I kept looking at different apothecary-themed art, and it just was too kitschy. 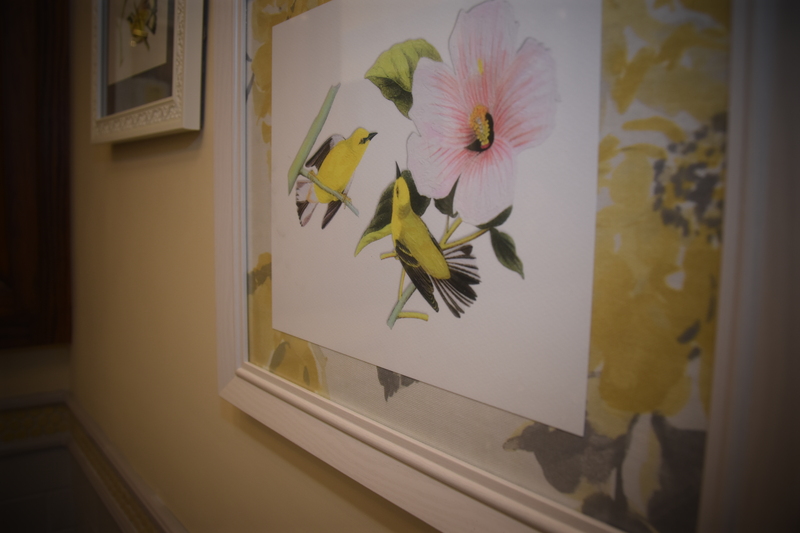 And the more I lived with the wallpaper, the more I kept feeling like birds or botanicals fit. So I love these prints! 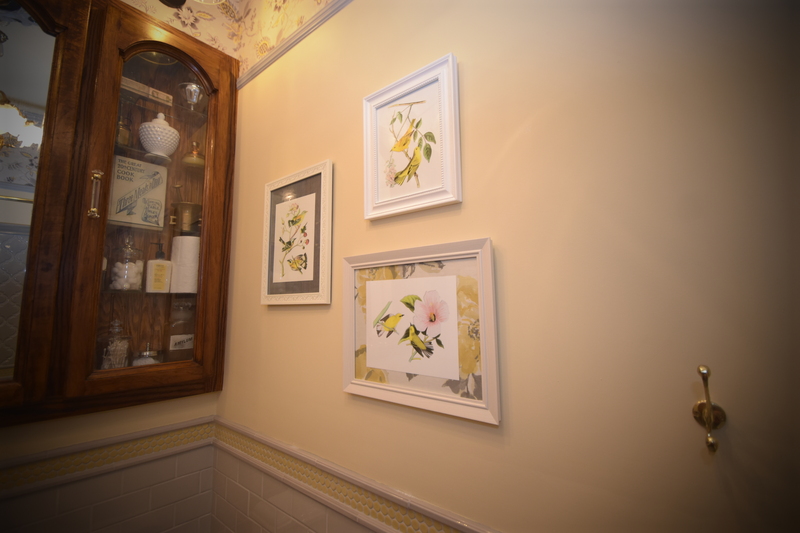 I “matted” them on top of remnant fabric that I found at Joanns. It was SO much work to get here, but we are thrilled. 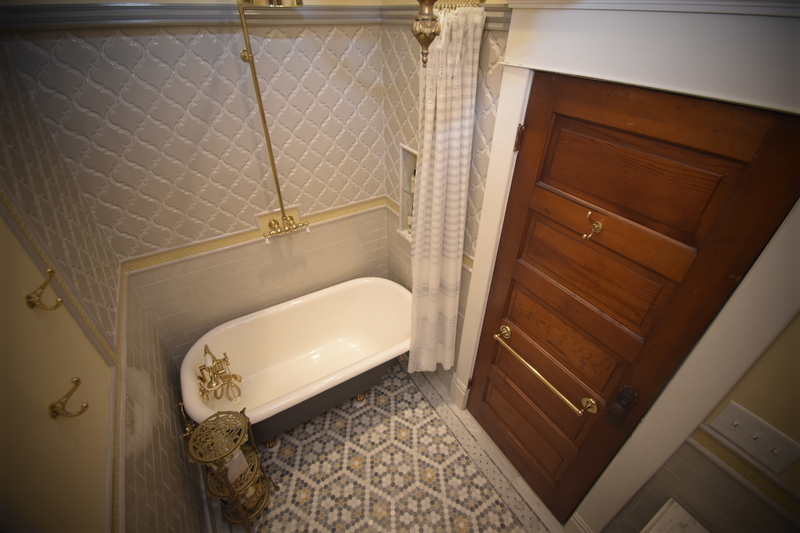 I love bathroom design so much, and I am so excited (cursed? lucky?) 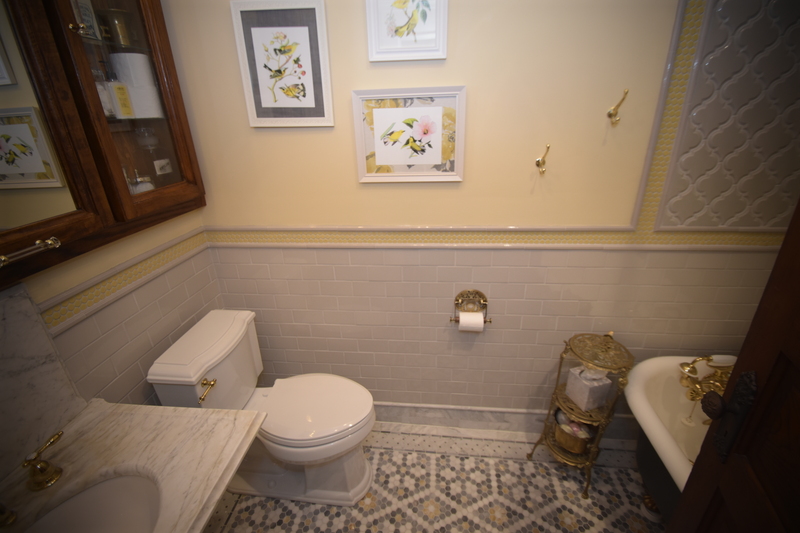 that we have FOUR more bathrooms to go. The bar has been set. 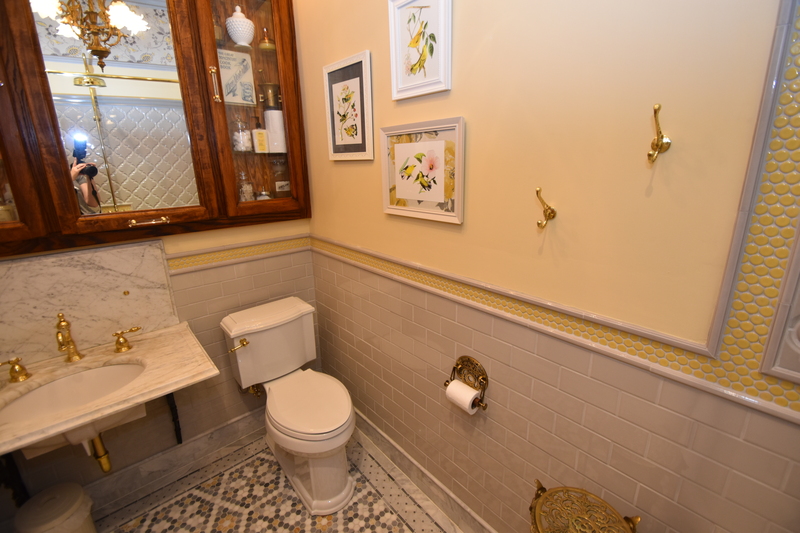 I have seven bathrooms in my 1894 house. And not one is done or anywhere near done! Most do not even function! So, I am insane with jealously over the Fabergé egg you have created! You are completely lovely. 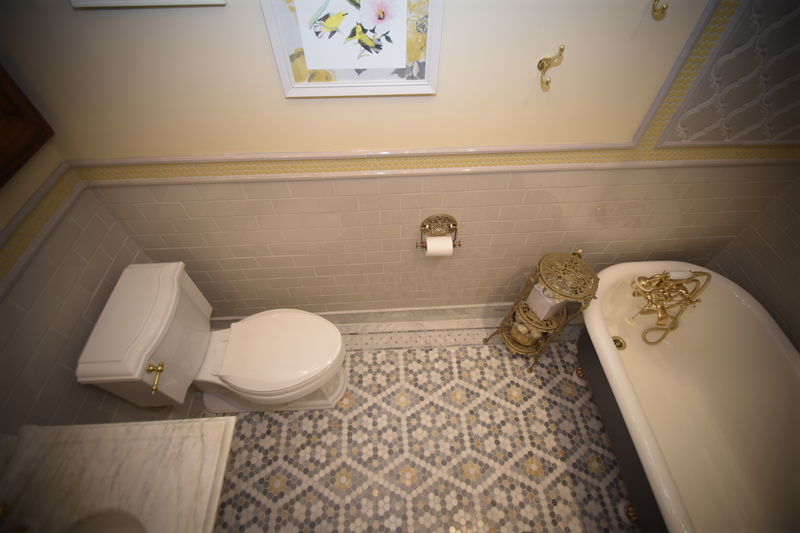 And I cannot WAIT to see the amazing things you do with SEVEN bathrooms! Wonderful!! Can hardly wait to see your design for the next one! Thank you! Hopefully the next one doesn’t take a year and a half! It is FABULOUS! I want to come stay at your house! Dragons are so cool! The dragons are pretty awesome. I always feel the need to point them out to people when they go in the room! Wow, you should be so proud of yourselves. Amazing work! 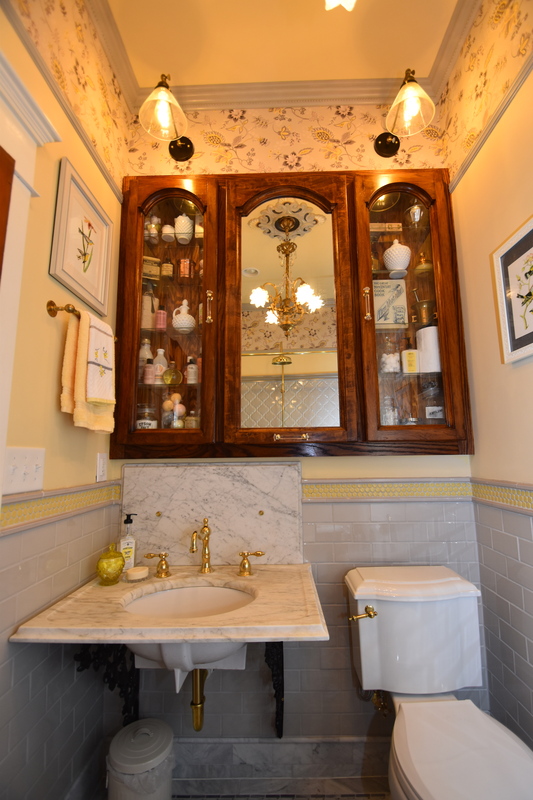 That is one of the most beautiful bathrooms I’ve ever seen and so wonderfully captures the Victorian aesthetic! 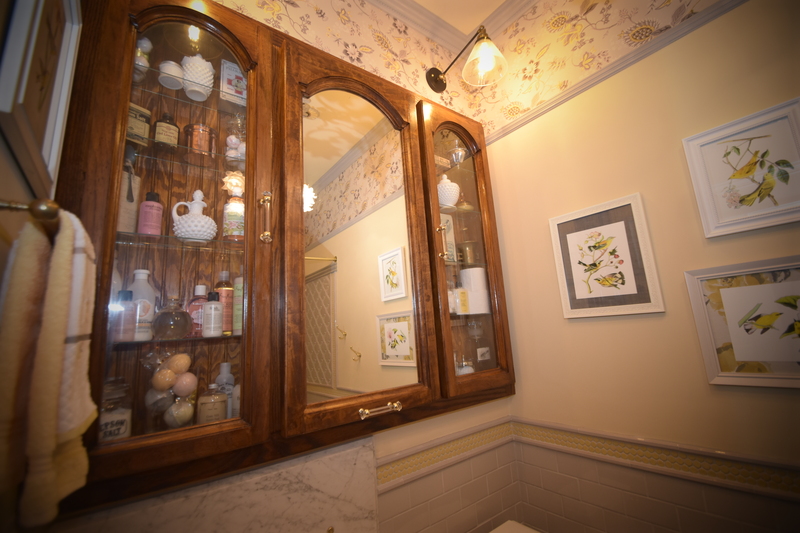 Kudos on a really terrific piece of art and also, just so happens, a functional bathroom. Thank you! I try so hard to make everything as functional as possible. I want the house to be lived in and loved. You and Doug have outdone yourselves. 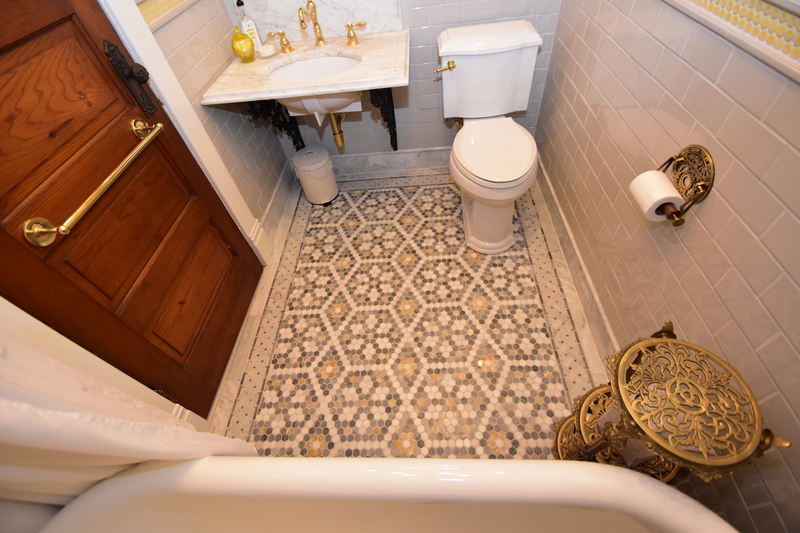 That is one gorgeous bathroom and I’m gobsmacked by all of the fabulous details. 🙂 Thank you, so much! 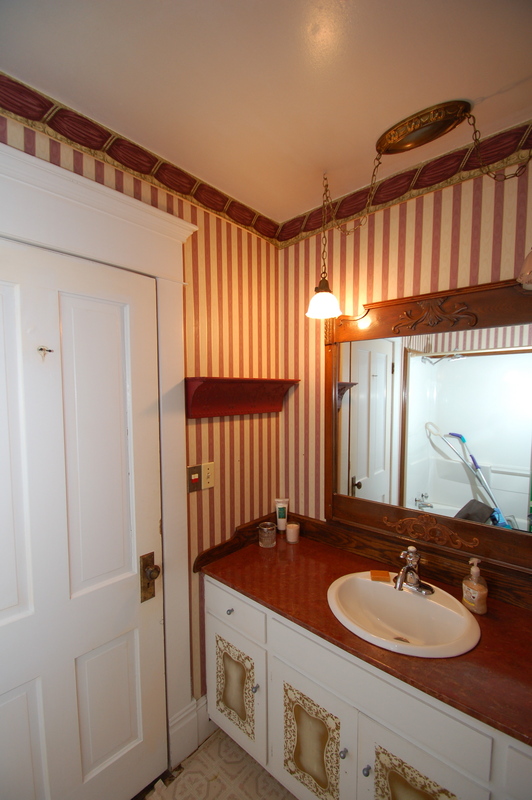 This bathroom is fabulous! 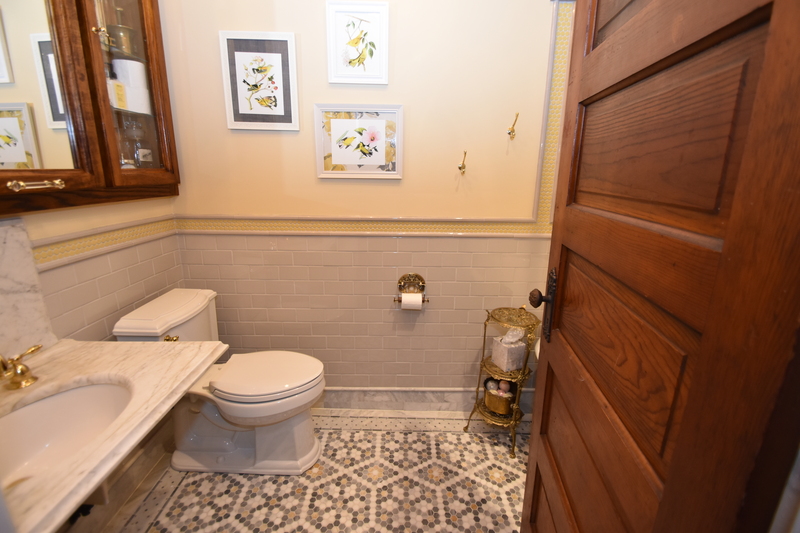 I love all the tile work, and the color scheme is to beautiful. 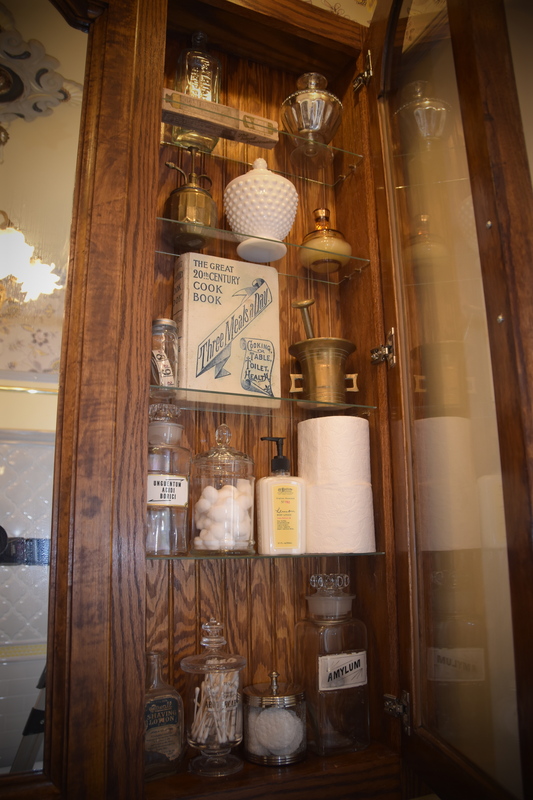 The apothecary cabinet and all its lovely content is also just perfect. You can be very proud of all the hard work! So thankful this took a year and a half…because it turned out spectacularly! 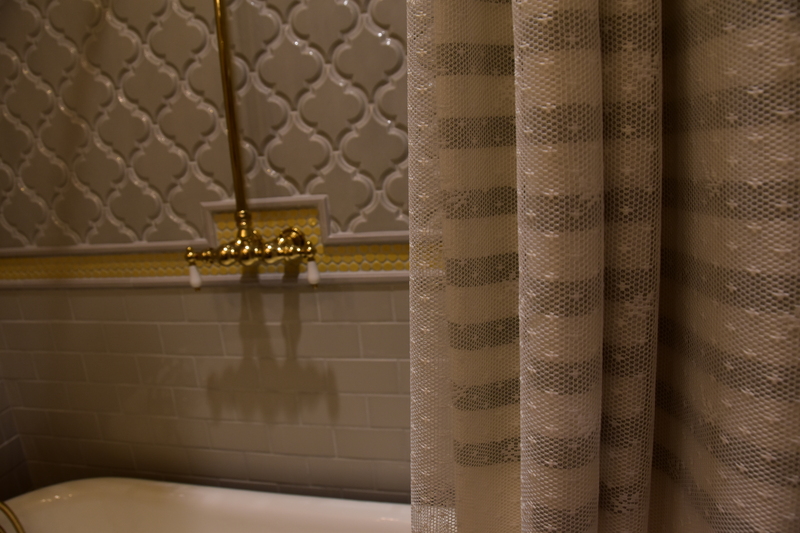 Every detail meticulously planned and executed. No rushed into decisions, so No regrets! 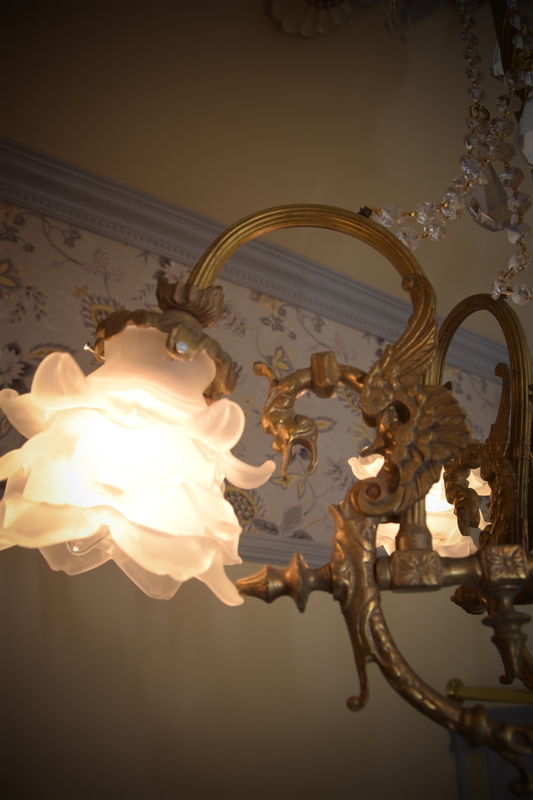 Fabulous chandelier! 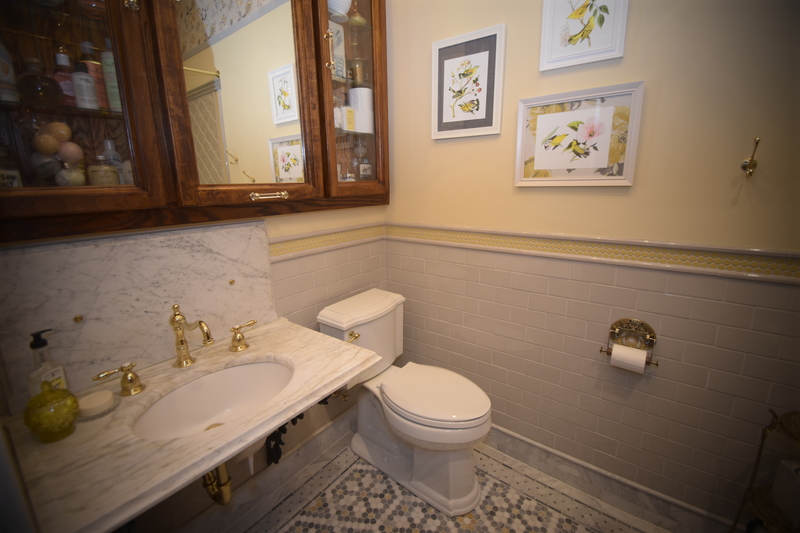 Fabulous tile work! Fabulous cabinet! Impossible to choose a favorite! Wow. Thank you so much Suella. I really appreciate it! 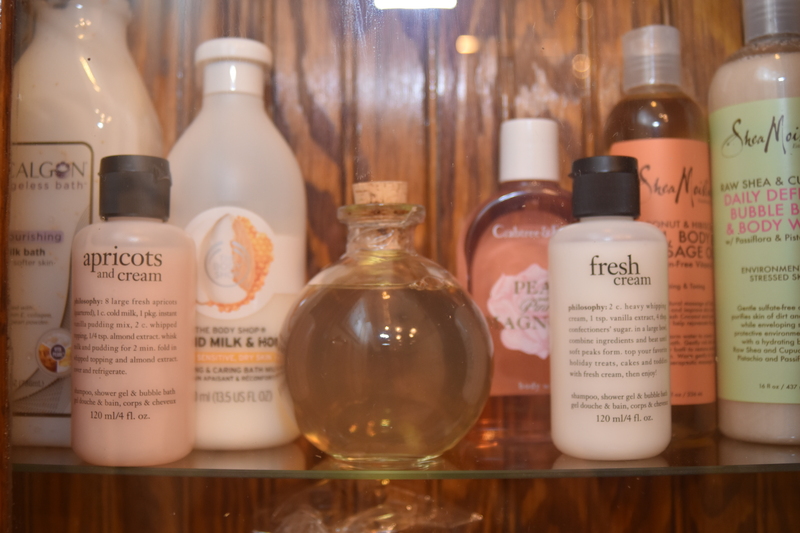 You were asking about bath bar items, Pure Haven has some LOVELY bath salt soaks, sugar scrubs, and steam facials that I think you would really enjoy. You can find them at my website http://www.phebydana.com. Not only do they smell amazing, but they feel and look beautiful too! 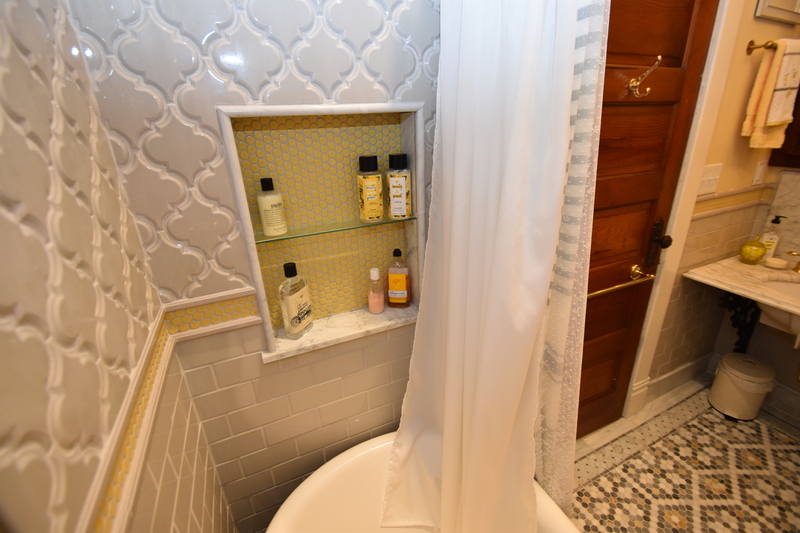 The room looks great, my house has an almost identical layout… How you use the shower without water getting all over the floor? 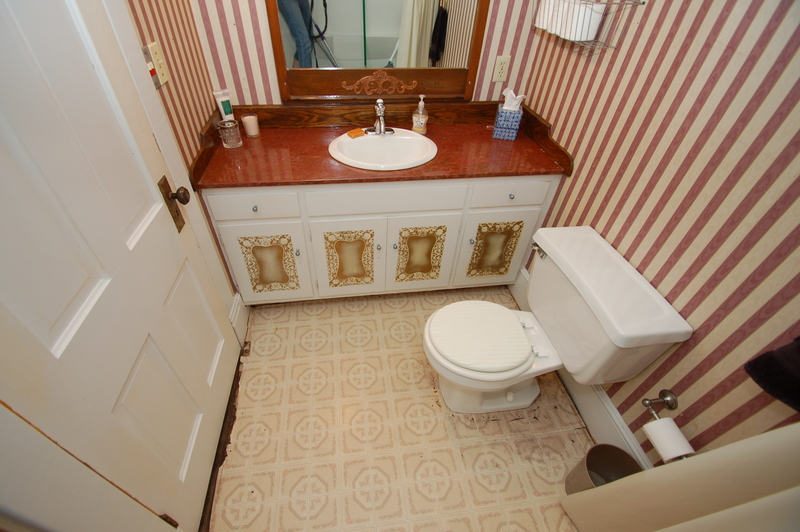 Is that a drain in the floor behind the tub? 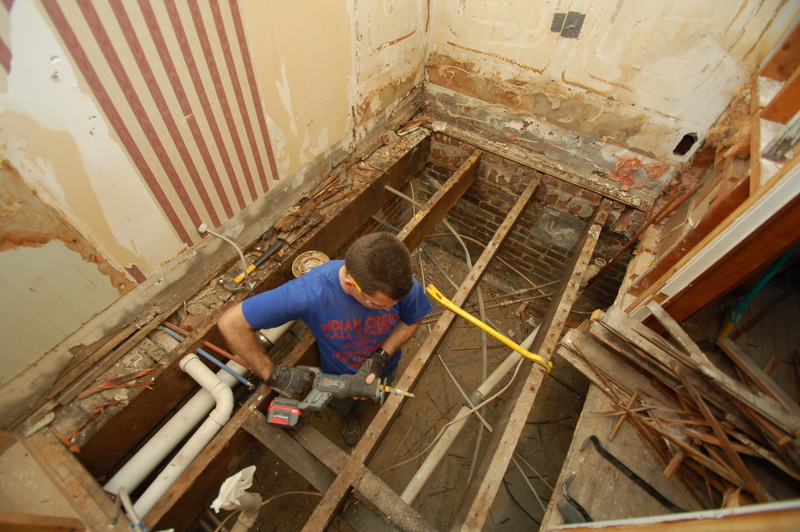 There is an infinity drain in the floor, under the tub! Please do! Thank you so much, Sue! It is beyond amazing! The info on the dye and shellac to match the door is so helpful. 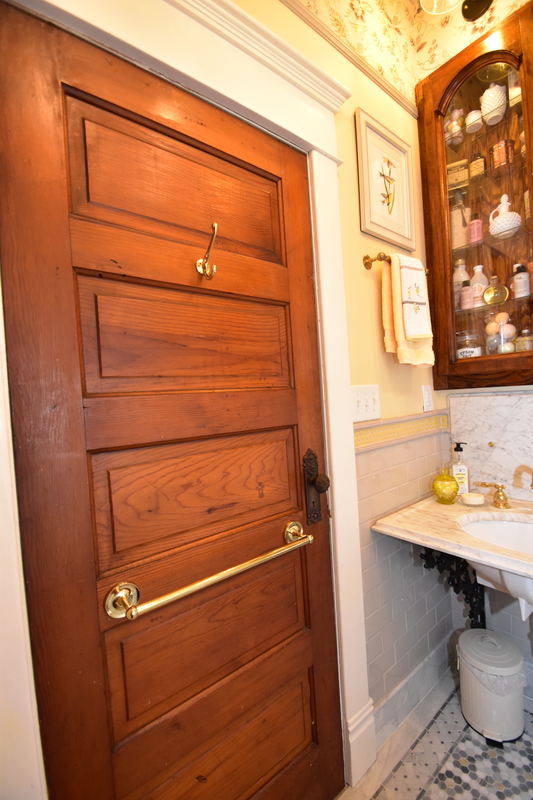 I can’t wait to reno my bathroom! Thank you! I think I’ve looked at their site before but it’s been a while! I appreciate knowing as many places to find treasures as I can! Thanks, Rene! I wasn’t expecting it to be a favorite part for me, but it really is for me as well! Amy, it’s amazing! You must be thrilled – congrats to you and Doug for a brilliant transformation. 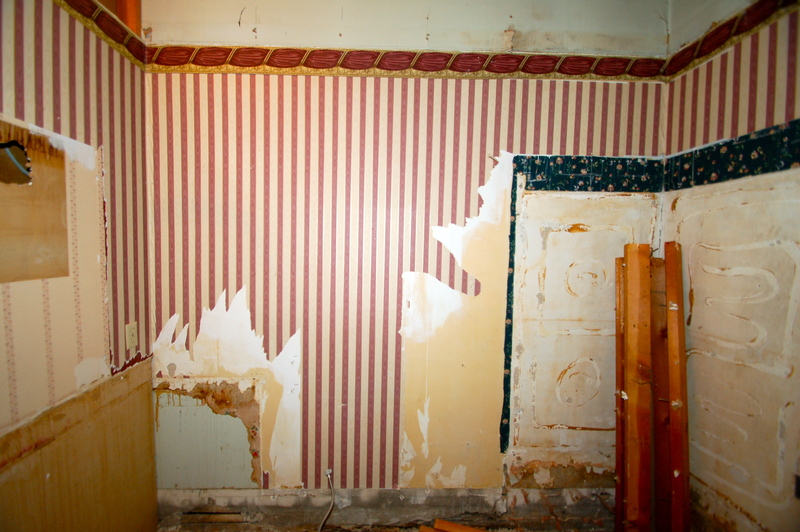 It’s been wonderful to watch this develop from way back when those tiles were just patterns on paper! 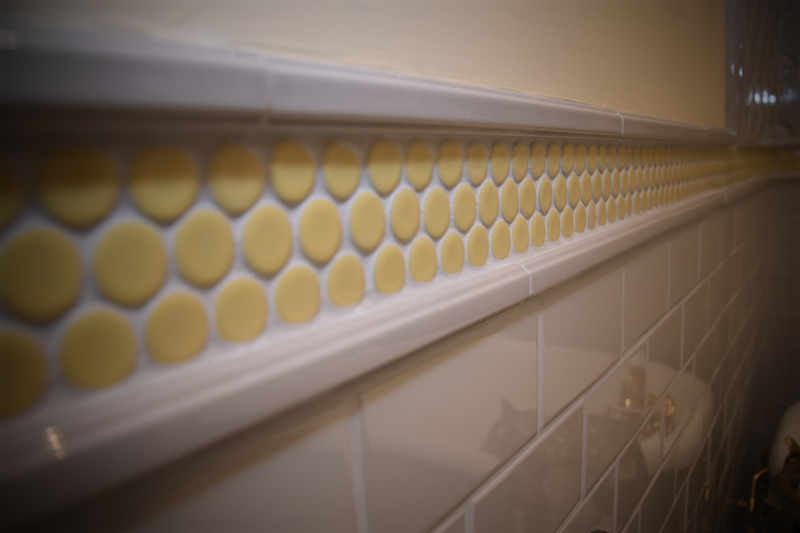 My favourites are the tiles and the apothecary cabinet – but it is all marvellous. Thank you, Carol! I am THRILLED you like it! Really beautiful! What an inspiration. 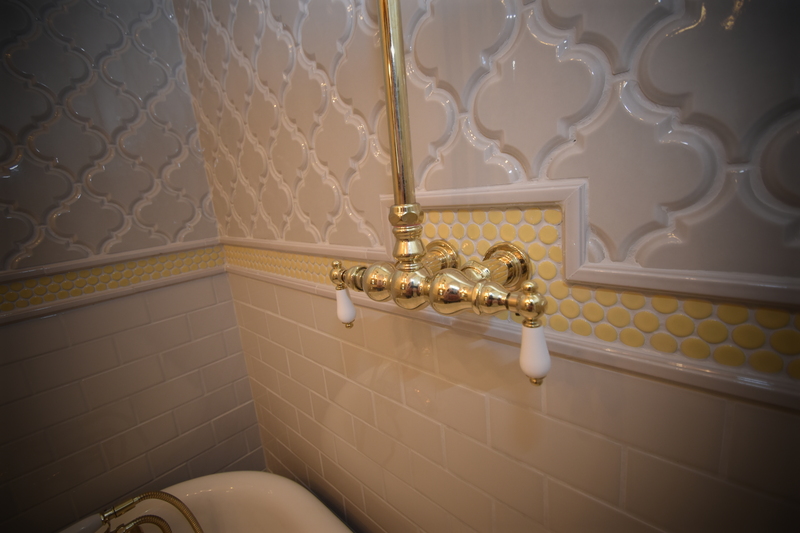 I just got through salvage the same sink, only the marble part… I am having a challenge finding the right brackets, any guidance on what to look for, I am nervous to get something that is not going to support it. 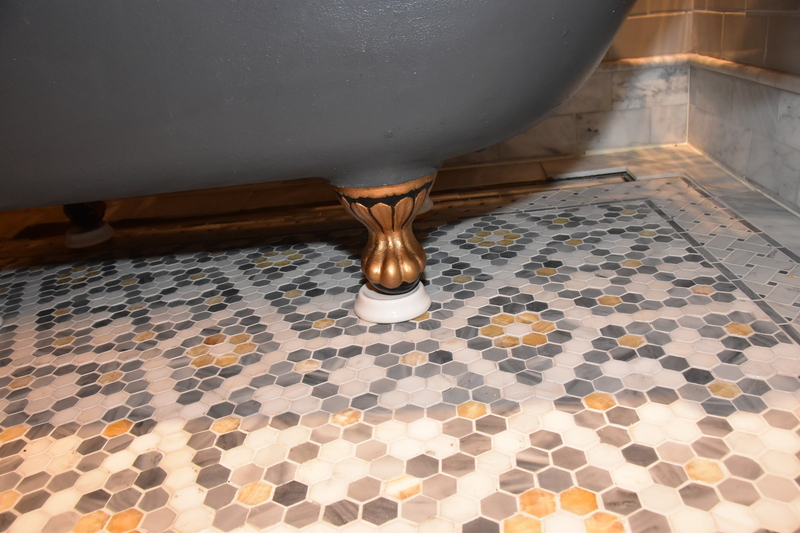 We also did a floor drain under our clawfoot, and I wish I’d thought to do the long one against the wall like this. Looks awesome.